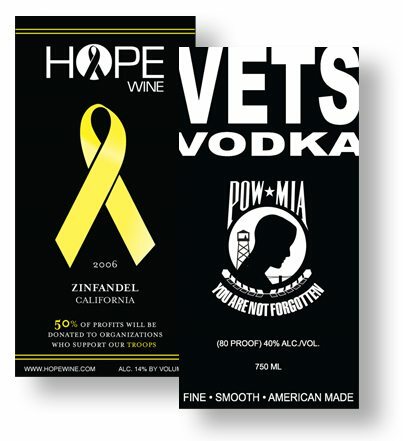 Here are a few charity-themed alcohol beverage labels. They are becoming more common, to the point where TTB does have a specific policy. In general, of course the charity language has to be truthful and non-misleading — but also, it needs to have a bit of specific information (such as the name of the charity). Vets Vodka is bottled by Terressentia of North Charleston, South Carolina and benefits the National League of Families (POW-MIAs).